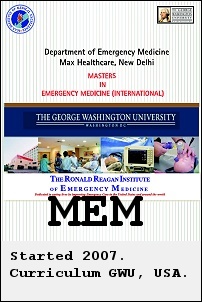 MD (Emergency Medicine) approved by the Medical Council of India (MCI), was started in July 2009 and, after almost 3 years, there are only 9 seats across India. 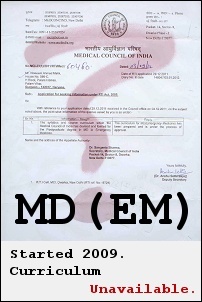 Yesterday, we received a document forwarded by an EM consultant showing the reply from the MCI when asked for the syllabus of MD(EM). It was sad to note that the MCI was still unable to provide the critical document, even though there were postgraduates already in training. It is only speculation on how they are being trained or guiding themselves. In contrast, all the older EM training institutes (majority being private corporate hospitals) followed well defined curriculum documents, drafted by Western authorities, and which were implemented in the Indian environment for many years. Its no secret that the private sector has created close to 99% of existing EM physicians and is home to the pure EM faculty. But there seems to be a standard procedure in the Government to ignore all available resources and reinvent the wheel. Since 25 years! Click on image to see related document. 1. EmergencyMedicine.in does not endorse or recommend any of the hospitals or training programs shown in the above documents. 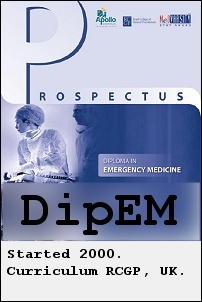 DipEM, MCEM and MEM residency training programs are available at multiple institutes across India. 2. 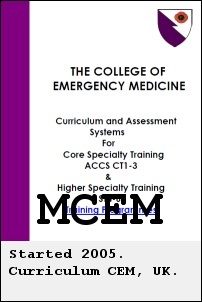 EmergencyMedicine.in recommends the curriculum documents of the College of Emergency Medicine, United Kingdom. 3. Many other private institutes like CMC Vellore, MIMS Calicut, MMHRC Madurai, etc, and deemed universities running the MD (Accident & Emergency Medicine) also had their curriculum defined and verifiable. 4. There was no response from the current MD(EM) postgraduate trainees when requested to provide the curriculum details. Copyright ©2012 EmergencyMedicine.in All Rights Reserved.